Bored with the same old chicken for dinner? Try this recipe for Buttermilk Pecan Chicken. With just five ingredients and 30 minutes of cook-time, it's practically guaranteed to become your new favorite dish. 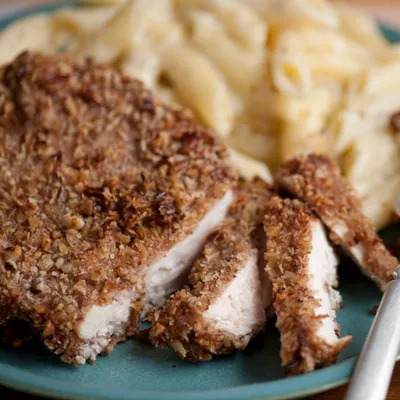 The crunchy coating of panko breadcrumbs and pecans makes this baked chicken taste like fried, but without the extra fat and calories. You get 47 grams of protein and just 10 grams of fat per serving. Need more ideas for cooking chicken? Stay slim with these 15 healthy grilled chicken recipes.